Today on CNN’s Fareed Zakaria GPS, Ciamak Morsadegh, Member of Parliament of Iran spoke exclusively to Fareed Zakaria during his visit to the United Nations General Assembly with Iranian President Rouhani’s delegation. He discussed the historic contact between the political leadership of the United States and Iran, and described what life is like as a Jewish minority in Iran. A full transcript of this interview is available after the jump. 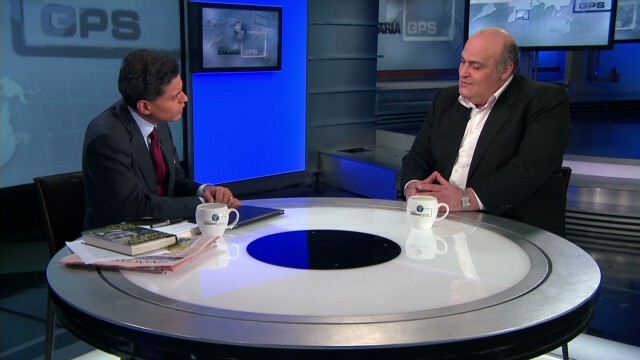 Fareed Zakaria GPS airs on Sundays at 10:00am and 1:00pm Eastern on CNN/U.S. and at 3:00pm Eastern on CNN International. FAREED ZAKARIA, HOST, CNN GPS: Now for our “What in the World” segment. This is usually the part of the show where I offer a take on something that caught my eye. Well, we’re going to do something different this week. It is an interview. And that’s because the thing that caught my eye this week was a person who accompanied Iran’s president to the United Nations this week. He’s the only Jewish member of parliament in Iran. You’ll remember that Iran’s last President, Mahmoud Ahmadinejad, famously denied the Holocaust ever happened. So what is life like for Jewish people in Iran? I asked Ciamak Morsadegh. ZAKARIA: A pleasure to have you on. CIAMAK MORSADEGH, IRANIAN MP: It’s really nice to be here. ZAKARIA: So let me start by asking you, do you have any concerns that President Rouhani does not acknowledge the Holocaust or is in some way hostile to Jews? ZAKARIA: What did he say? What did he say? ZAKARIA: In the early days of Ahmadinejad’s presidency? MORSADEGH: Yes. Yes. But after that, there was no problem. And our day to day lives do not have a specific change during Ahmadinejad’s period. ZAKARIA: Do you feel as a Jew in Iran, do you feel persecuted in any way? MORSADEGH: Of course, being a Jewish minority in a religious country have some problems. But after the revolution, step by step, our problems are being solved. Today, our condition is better than yesterday. And today, our condition is much better than 10 years or 20 years ago. ZAKARIA: Are you allowed to worship freely, go to synagogue, observe religious days and — and — and a — and occasions? MORSADEGH: For religious freedom, Iran is one of the most free countries. You can go to synagogue. You are — we can have our ceremonies. We have kosher butchery. In Tehran, there is more than 10 kosher butcheries, five kosher restaurants. We have our specific school. There is today more than five Jewish schools in Tehran and our children are completely free to go to Jewish school or public school. ZAKARIA: Do you believe that the Jews need and are entitled to their own state, the state of Israel? MORSADEGH: There is — I think that there is a difference between religion and race. And I think that all countries in the world must be in a democratic way, selected by the people of the country. If most of the people are Jews and they want to have a Jewish country, there is no specific problem. But me having a Jewish state, must respect the right of other people to have a country for themselves and live in a peaceful condition. ZAKARIA: So what does that mean? You know, if you were asked a question, are you a Zionist, how would you answer? MORSADEGH: No. No, I’m not a Zionist. It means that I am not in complete direction of what Israel regime and Israel army do. Many Jews in different parts of the world have severe critics to the behavior of the Israel regime and Israel’s army. And they have some problems with the behavior of Zionists. ZAKARIA: But do you believe Israel has a right to exist? MORSADEGH: I think that every country in the world must follow the way of democracy and democratic procedure. And every country that goes in a human rights behavior has the right to exist. ZAKARIA: What do you think of the Israeli government’s attitude toward Iran? There are — there is talk that Israel might attack Iran’s nuclear facilities. MORSADEGH: I think that every man and every political man who have complete wise does not want to start a war because everyone who starts a war in the Middle East cannot finish it. Starting a war is an unwise procedure. You see in Iran-Iraq War, all of the Iranian people participated in the war for defending their country. For example, myself was the volunteer for more than 80 months in Iran-Iraq War. And I am sure that if anyone want to attack my country, I am ready to donate my blood for my country. ZAKARIA: Finally, do you have a message for Jews in America and around the world about — about Iran and its Jews? MORSADEGH: Yes. My message for all of the Jews in the world is that we, all of us, as the followers of Moses and believers to Torah must doing the right way the Torah say. And the most important point of Judaism is a specific sentence which says that: ve-a-havtah le-rey-ah-kha ka-moh-kah. It means that you must like your brother and your sister such as yourself. And we must like each other in the world and each humankind such as ourself. MORSADEGH: It was a pleasure to be here.